Who among us doesn't have Avon books on our keeper shelves? In my home library, there are Avon authors with their own keeper shelves! Eloisa James. Sarah MacLean. Elizabeth Boyle. Julia Quinn. Tessa Dare. Loretta Chase. Julie Anne Long. Cathy Maxwell. Susan Elizabeth Phillips. Lisa Kleypas. Toni Blake. These are but a few of the Avon authors who have brought me hundreds - okay, probably thousands - of hours of reading pleasure over the years. Then there are the newer authors on Avon's team such as Jennifer McQuiston, Eva Leigh, Lenora Bell (who makes her Avon debut April 26th with How The Duke Was Won. I've read it and it's fabulous!) and Jennifer Ryan (love her Montana men!). Time to make room for more keeper shelves. And we must not forget the old school Avon authors such as Kathleen E. Woodiwiss. I'm sure we all know someone who was introduced to romance fiction through a Woodiwiss book. Avon Books has been bringing us the classics of romance reading for the past seventy-five years and shows no signs of slowing down. They recently announced plans for their year-long 75th Anniversary "Diamond" Celebration, including many sparkling events for readers. There will be more "KissCon" reader parties as well as gala signings at the RT Booklovers convention in Las Vegas in April and the Romance Writers of America National Conference in San Diego in July. Can't make it to those events? Not to worry! There will also be many online events, including re-reads and author/reader discussions of the "diamonds" of Avon's published books as well as previously published Avon titles at special prices. As part of their celebration, Avon will also be releasing a special diamond anniversary edition of Woodiwiss's Shanna with a special foreword by Lisa Kleypas. For more information on Avon’s 75th anniversary, visit www.avonromance.com for a complete list of activities, authors, special editions, and reader engagements. Which author was your introduction to romance? Which new Avon books are you looking forward to reading this year? Will you be attending any of the Avon Diamond Anniversary events? One randomly chosen person leaving a comment will receive a print copy of Cold Hearted Rake by Lisa Kleypas and a signed, print copy of Glitter Baby by Susan Elizabeth Phillips. Deadline for comments to be included in giveaway: 11:00 p.m. (EST) January 21, 2016. I don't have a favorite author I read and appreciate all authors and their works equally. Johanna Lindsey books introduced me into the world of Romance. I picked up one of her titles 11 years ago and there was no looking back for me. I love Avon Romances so I'm looking forward to every book they publish from whichever author as long as Avon publish it no matter which author I'll buy and read it. In that way I get introduced also to new authors. With regards to the event I don't know much about it I'll have to get more information about it before I decide. Thanks for stopping by, Natasha! Johanna Lindsey is one of those authors with her own keeper shelf in my house. I adore her Malory family! Kathleen Woodiwiss was my first romance. I look for books by Avon authors Eloisa James, Julia Quinn, Julie Anne Long, Cathy Maxwell, Susan Elizabeth Phillips, Lisa Kleypas... I don't have any specific titles I am watching for but How the Duke Was Won looks great! I can't attend the in person events but will look for online events I can participate in. Thanks for the giveaway! I'll be looking for those online events too, Robin. I'm sure Avon will have lots of them. How the Duke Was Won was a lot of fun. Lenora Bell is a RWA Golden Heart Award winner and this book is her published debut. I predict good things ahead from this talented author! Kathleen Woodiwiss was definitely the author who got me hooked on romance. I've read all the authors you mentioned in your first paragraph and enjoyed all of them. There are too many great ones to pick one favorite!! And if there is anything online for this event I'd love to join in! I love all kinds of Avon authors! Eloisa, Lisa Kleypas...Lorraine Heath, Julie Anne Long, Julia Quinn, Cathy Maxwell, Tessa Dare...many, many more that I'm not remembering. I love Avon. I think they've been brilliant; and I'm so so glad they're going with the population who enjoys more varied romance and allowing the authors to give that to us! My first romance? Janelle Taylor, I believe--it was called First Love, Wild Love--and it was a Texas Ranger romance with a heroine who had to stay the night in a brothel and was mistaken for a prostitute by the hero. I loved it a lot! But then I immediately got hooked on Jude Deveraux and Julie Garwood...and there we go. I have SEVERAL pre-ordered Avon books, typically from my favorite writers: Eloisa James, Lisa Kleypas, Tessa Dare... I don't always pay attention to the brand (Berkeley, Grand Central, et al, are also romance lines)--but Avon certainly is the brand everyone remembers. :) Love them. That Texas Ranger romance sounds familiar and sounds like fun. Ahh...Deveraux and Garwood. I gobbled their early stuff as fast as I could. I have quite a few favorite Avon authors: Julie Anne Long, Julia Quinn, Lisa Kleypas, Susan Elizabeth Phillips, Rachel Gibson and Lorraine Heath. Shanna was my the first romance book I read. I'm looking forward to the release of Marrying Winterbourne by Lisa Kleypas and the return of Susan Elizabeth Phillips to her Chicago Stars books. I'm with you on Winterbourne's story, Kim. And I'm so excited to return to the Chicago Stars! Many of my auto-buy authors--Ashe, Chase, Dare, Guhrke, E. James, Kleypas, JAL. MacLean, Maxwell, McQuiston, SEP, J. Quinn, and the newest addition to that list, Eva Leigh--are Avon authors. So are many other authors whom I read often. I started reading romance novels the summer I turned ten. The first was an Emilie Loring, but I'm not sure which one since I read a dozen or more within a couple of weeks. 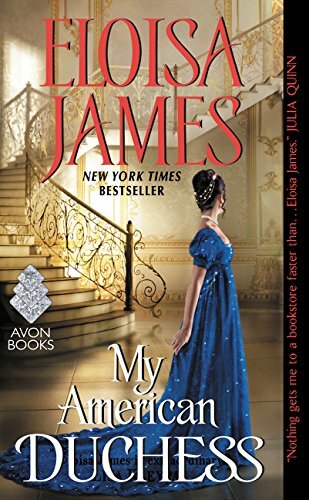 There are definitely Avon books on my most anticipated list--Eloisa James's Seven Minutes in Heaven, Julia Quinn's Because of Miss Bridgerton, Lisa Kleypas's Marrying Winterborne, Tessa Dare's Do You Want to Start a Scandal> (a new Spindle Cove), Julie Anne Long's Hot in Hellcat Canyon, and Susan Elizabeth Phillip's First Star I See Tonight are just a few of them. You beat me by a couple years, Janga. Victoria Holt got my started when I was 13 and I never looked back. I have all of those books you listed on my "must read" list for this year! Some 20 years ago at the Books & Company bookstore in Dayton, Ohio, one of the booksellers put Julia Quinn's Splendid in my hands and told me "you'll love this one." JQ's books have the most space on my keeper shelf and share space with many other Avon authors. 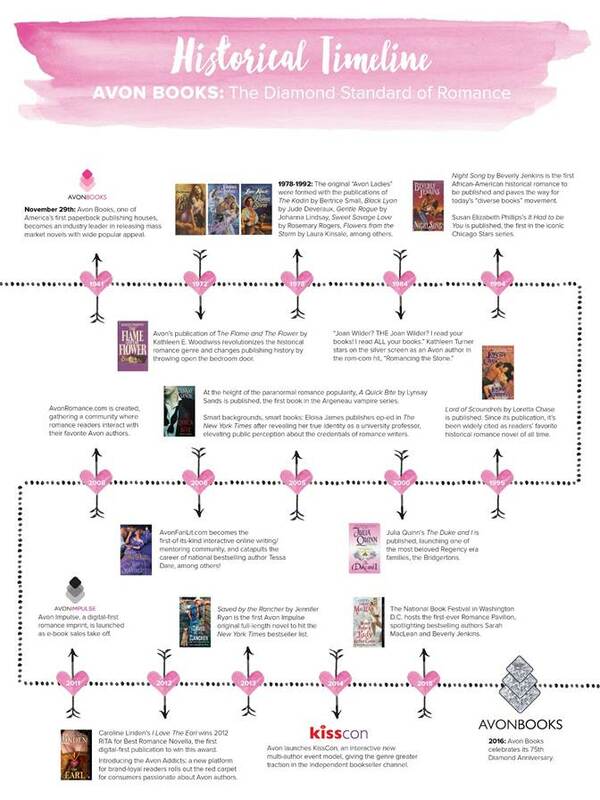 I have read romance on and off since stealing peeks at Harlequins at my Grandma's as a pre-teen. I'm looking forward to seeing what Avon is planning for its Diamond Anniversary events. I love that a bookseller handed you a romance! I discovered Julia Quinn in 2006 when an online friend recommended her new book, The Duke and I (first of the Bridgerton's). I bought it, devoured it, then immediately bought her backlist and have since purchased every book she's published. She's one of those authors who has her own keeper shelf in my home library. I was a regular there, so she knew what I liked. Books & Company was a wonderful place with really good booksellers and lots of author signings. Every author you named has at least one book on my keeper shelf. Avon Books consistently puts out high-quality romances. It will be fun to celebrate along with Avon this coming year. I'm looking forward to seeing what they come up with for this year-long celebration! I don't think I've read an Avon Book that I haven't enjoyed. If I don't recognize an author's name I'll check who published the book - if it's Avon I'll check it out some more and probably want to read it. Cathy Maxwell & Eloisa James are particular favorites. Cathy Maxwell and Eloisa James are favorites of mine too. I have the honor of being on a panel with Cathy Maxwell in Richmond, Virginia next month. I know I'll spend the entire evening grinning! Wonderful authors. Eloisa, Kleypas, and so many more whose books are captivating. When the Avon Books are out I am in heaven. The books bring me great enjoyment and adventure. Eloisa James, Julia Quinn, Kathy Maxwell. I was introduced way back to books by Rachel Gibson and SEP. I look forward to wonderful reading this year. SEP's new one and Julia Anne Long. Rachel Gibson's hockey books are some of my favorite contemporary romances. Shanna was my 1st (wolf & the dove is still one of my faves) & use to read & reread Lindsey (among others) to escape school & early career craziness. I've re-read Lindsey's Malory series a couple times and favorite individual books more than that. Sarah MacLean and Eloisa James are perennial favorites. It's crazy but all those listd are my favorites. I've read and loved their books. The first romance book I picked up was the first book in Nora Roberts The Sisters Trilogy. From that book on I've read everyday. Thank you PJ for the post and the heads up. My first introduction to romance was Barbra Cartland books. After that, I graduated to Kathleen Woodiwess and other wonderful Avon authors. I don't really have any favorites. I love them all. I'm really excited about Avon's 75th anniversary. In most cases, I don't pay any attention to who the publisher is. I had to check my shelves to see who I have. Eloisa James, Cathy Maxwell, actually looking at it, I could just use your list. My first romance was by Julie Garwood and she won me over for good. Shortly afterwards, I read THE WOLF AND THE DOVE by Kathleen E. Woodiwiss. I am trying not to look at what is coming out soon. My TBR Mountain is too big already. I didn't find any events to attend. If there were any close by, I would. I will be getting their newsletter, so I am sure there will be on line events coming up. I have soooooo many books to catch up this year. I want to read as much as I can get my hands on, and have time to read them. Avon Diamond Jubilee events? Only if it's close enough, and everything work out that I can take time off to go. I've never done that before (to any BIG book events) though, imagine it would be great crazy fun to be packed in a room full of authors and tons of books like that, all in one place!! !